Golf is tricky enough the way it is. No,what Jeev did was play the tournament without a practice round, relying on the yardage book to go around the first day. And he shot a 65, his lowest number for the week. Sometimes, it helps not to know where the bunkers and bushes are. One of the reasons why I’m a big golf fan is that the game is so much like life itself. In both cases, the more complicated you make it, the more entwined they become. Golf can tie you up in knots if you start thinking too much about technique. I know of a guy who got so caught up with his knees, elbows and hips that he lost sight of the fact that the golf ball has to drop in that hole. At the end of the day, what you need to do is swing back and through. The ball just happens to come in the way. Keep it simple, is what I’m saying. Jeev Milkha Singh did that recently and what a pay off! He teed it up blind at the Celtic Manor Resort and finished tied 10th in the Wales Open. Now, when I say “blind” I don’t mean that some sadistic tournament organiser came up with a new format whereby participants were handed out blindfolds on the first tee. Golf is tricky enough the way it is. No, what Jeev did was play the tournament without a practice round, relying on the yardage book to go around the first day. And he shot a 65, his lowest number for the week. Sometimes, it helps not to know where the bunkers and bushes are. Of course, this wasn’t a new addition to Jeev’s usual tournament preparation. It just so happened that the Pro-am, which he usually uses to get acquainted with the golf course, was rained out. A week later, the same thing happened in Austria. Jeev wasn’t even planning on playing as he was hoping to get into the US Open. When he finally didn’t, he flew into Vienna on Tuesday night only to watch the rain from his hotel room window over the next two days. Another blind start and a 64 this time. As if that wasn’t low enough, he went one better the next day. After those two outings, all he needed to do was shoot level par and win the three-day Bank Austria Golf Open. “Not bad at all. 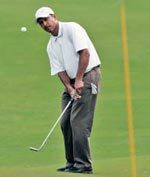 Maybe this is how I’ll play my tournaments from now on,” said Jeev after a fruitful fortnight.